The electrical panel in your home or place of business is the first line of defense in protecting the wires used to deliver electricity safely for your use. The idea is simple, the size of the wire determines the amount of amperage it can safely handle without overheating. Overheating will breakdown the protective jacketing encasing the conductor and eventually the conductor itself, and that is a serious problem! Like anything else over time electrical circuit breakers will wear out along with the other components of the panel. When a breaker wears out it can start to "trip" or open, interrupting the flow of electricity even though the circuit is not over loaded. This can be hazardous and the problem should be addressed. What is far worse than that is when the circuit breakers cease to stop the flow of electricity when the circuit is overloaded! This is a very serious problem and will not only damage the jacketing but the conductor itself. How quickly the jacket and conductor breaks down depends on how overloaded the circuit is, and for how long it has been that way. If the panel providing your electrical protection hasn't been inspected in the past, make an appointment today. 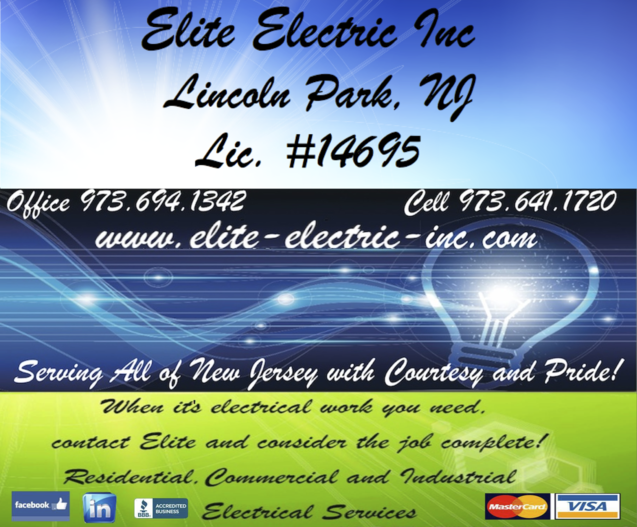 Elite Electric Inc. can quickly and easily evaluate your electrical service panel and provide professional advice on the course of action needed.